Maybe we’re a little biased, but we think landscape design is one of the best gifts you can give to your spouse on Valentine’s Day! When you really think about it, landscaping disagreements can cause a lot of marital troubles. Maybe your wife has a pile of two-by-fours sitting in the corner of the yard because she started to make a raised garden last June and literally has not touched it since. Or perhaps your husband swears that he’s going to lay those brick pavers and make a beautiful pathway where he dug up the grass two years ago. It could be that you even promised your partner a koi pond when you bought your home in 1998 and you’ve yet to follow through. Projects that you start in the backyard often go unfinished. It’s not hard to figure out why. We get busy, and we think, “No one goes in our backyard so it’s really not a huge deal.” But months and years of unfinished projects can cause a little bit of resentment in a relationship and turn a small issue into a bigger one. 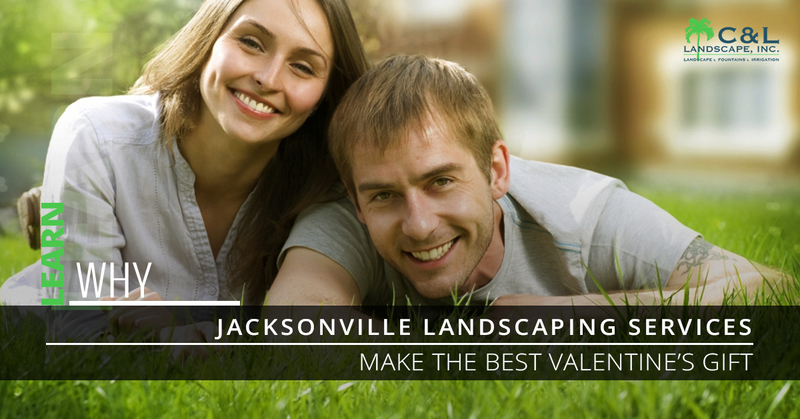 Why not surprise your spouse with landscaping services this Valentine’s Day? A bouquet of flowers is nice and all, but eventually it will wilt and be thrown in the trash. Why not hire C & L Landscape to come out and spruce up your yard with beautiful native flowers and plants that will grow and thrive? Or instead of going on a weekend vacation, put those funds towards a backyard kitchen that you can use for years and years to come? Basic Yard Maintenance: Is your yard completely overgrown? Maybe it just needs a good mow, some pruning, and fresh mulch to look like new again. Or perhaps you even want to incorporate some landscape design with an easy-to-maintain brick walkway. Finally Install Those Sprinklers: If one of you spends 20 minutes every day watering the lawn by hand, consider finally putting an end to that by having an irrigation system installed. This will give you more time to spend together and less time staring at the yard with a hose in your hand. Add A Romantic Pergola: Maybe your spouse has always dreamed of throwing parties in the backyard but feels like there is just something missing. A gorgeous wood pergola creates a welcoming entertainment space and adds an upscale feel to any yard. Create An Entertainment Space: Speaking of entertaining guests, getting rid of that old, cracked concrete patio and replacing it with gorgeous brick pavers or investing in a backyard kitchen with a built-in grill can give you a space that you’re proud to show off. No longer will you feel the need to apologize for the state of your patio next time you have friends over. Get That Backyard Pool You’ve Always Wanted: Whether you’ve always wanted a small koi pond or a big pool, we can help make it happen. Turn your backyard into a space you want to spend time with a nice blue pool to cool off in. Choose Our Landscape Design Services This February! Surprising your spouse with yard maintenance and landscaping might not seem very romantic at first, but you’ll soon realize that a unique gift idea goes a long way – and, if we’re being honest, it’s a win-win for both of you since you’ll get to enjoy that pool as much as they do! Get in touch with your Jacksonville landscape experts today and let us know how we can make your backyard a place you love to be!